For the third year in a row, the American Academy of Family Physicians (AAFP) named the UW School of Medicine and Public Health’s Family Medicine Interest Group (FMIG) one of 10 overall Programs of Excellence nationwide. 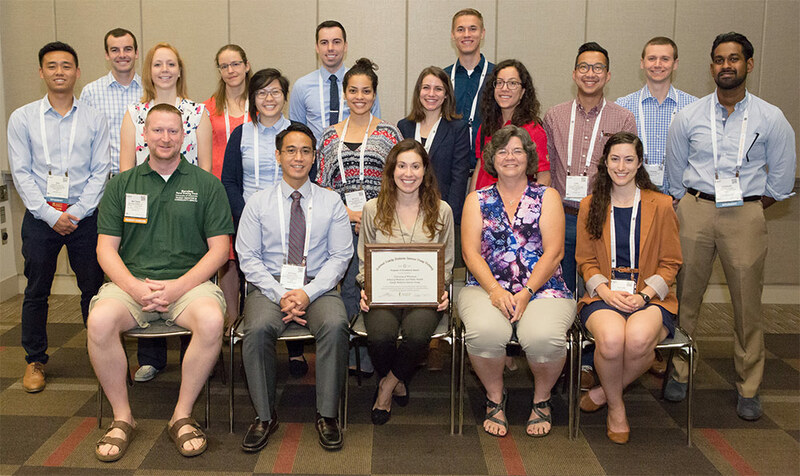 DFMCH and FMIG representatives received the award on July 28, 2017, at the AAFP National Conference of Family Medicine Residents and Medical Students in Kansas City. Front row, from left: Matthew Herbst, MD (FMIG resident liaison); Patrick Corpuz (M4); Jackie Gerhart, MD (FMIG faculty advisor); Joyce Jeardeau (FMIG staff advisor); Taylor Boland (M4). Middle row: Benjamin Nguyen (M2); Megan Bartz (M4; former FMIG student leader; Jenny Giang (M4); Natalie Guerrero (M3); Julia McPherson (M4); Tina Ozbeki, MD (FMIG resident liaison); Chee Lor (M4); Zeeshan Yacoob. Back row: Timothy Peterson (M4); Sarah Schaaf (M4); Zachary Ahola (M4); Collin Lash (M2; current FMIG student leader); Vincent Borkowski (M2; current FMIG student leader). The FMIG is a student-run organization supported by the Department of Family Medicine and Community Health (DFMCH) and the AAFP. Led by faculty advisor Jacqueline Gerhart, MD, and staff advisor Joyce Jeardeau, ACUME, it excites, promotes and supports medical student interest in the specialty through active learning, mentorship and exposure to the scope of family medicine. The FMIG kicks off each academic year with a half-day retreat for incoming student leaders (meet them at http://www.fammed.wisc.edu/fmig/) and faculty advisors, who plan the year’s activities and start to showcase family medicine in the first week of M1 orientation. Throughout the year, the FMIG sponsors such educational events as an annual procedures fair, a “Meet the Doctors” dinner, an M3/M4 rotations and mentorship meeting, monthly seminars and the Basic Life Support in Obstetrics (BLSO) course. It also offers students opportunities to shadow family medical residents on call at St. Mary’s Hospital and University Hospital, and supports scholarships for students to attend the AAFP National Conference each summer. The FMIG is also closely connected with Office of Medical Student Education’s medical student mentoring program, which pairs students with volunteer DFMCH volunteer faculty physician mentors who share their interests. Congratulations to everyone who makes the FMIG a success!